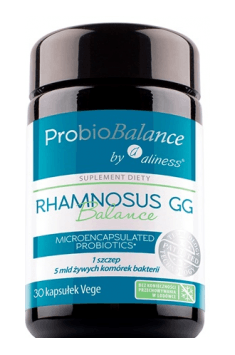 ProbioBalance by Aliness® Rhamnosus GG Balance is a dietary supplement consisting of one defined probiotic bacterial strain (Lactobacillus rhamnosus GG), enriched with a prebiotic (Fibergum ™ BIO LAW polysaccharide) and an extract of buckhorn plantain. For the preparation of the supplement, an advanced patented microencapsulation technology was used. It consists in placing each bacterial cell in a double lipid layer. Thanks to this, the survival of bacteria is significantly increased – they overcome the unfavorable environment of the stomach without problems, reach the intestines and are able to colonize them effectively. The effectiveness of the supplement is increased by the additives included in the composition. Acacia fiber (Fibergum ™ BIO LAW polysaccharide) acts as a prebiotic and provides an excellent nutrient for beneficial intestinal bacteria. In turn, the buckhorn plantain extract has a beneficial effect on the intestinal function and also has anti-inflammatory, antiviral and bacteriostatic properties. Lactobacillus rhamnosus GG (ATCC 53103) (LGG) is a Gram-positive lactobacillus that is part of the normal human gut microflora. As a probiotic, it was patented in 1985 and probably had the most clinical studies that document its positive effect on the human body. Interestingly, LGG affects not only the digestive system. It also has a beneficial effect on the immune system, supports the respiratory system, may facilitate the fight with obesity, and even promotes a good mood. The LGG strain is considered to be the probiotic with the greatest antidiarrheal potential. Increased frequency of bowel movements has various causes; however, it is most often caused by viral or bacterial infections. The L. rhamnosus strain, due to its ability to colonize the intestines, changes the composition of the intestinal microflora and reduces the number of pathogenic bacteria. In addition, it produces substances that inhibit the growth of pathogenic microorganisms. LGG is perfect during and after antibiotic therapy – it shows as much as 70% effectiveness in the prevention of drug-induced diarrhea. In addition, it reduces the risk of rotavirus-induced diarrheas. It is also recommended for people who travel abroad (especially towards Africa, South America, Asia) – used before and during the trip, it protects against the so-called "Traveler's diarrhea." LGG has a beneficial effect on the functions of the immune system. It can stimulate the humoral and cellular immune response of the body. It works by increasing the activity of T lymphocytes, NK cells and macrophages. In addition, it reduces the number of pathogenic bacteria, which relieves the immune system. Studies showed that supplementing preparations containing L. rhamnosus bacteria significantly reduces the frequency of influenza and upper respiratory tract infections. In addition, LGG has been proven to modulate the immune system's response after contact with the allergen, making it ideal for atopic dermatitis and various types of skin allergies. LGG helps in achieving and maintaining healthy body weight. The slimming effect of the strain has been confirmed in clinical trials with the participation of adults. They showed, e.g., that women who received a probiotic based on L. rhamnosus lost more kilograms than those given a placebo. What's more, the participants of the study reported a significant reduction in appetite. In turn, in animal studies, it has been proven that LGG inhibits the expression of lipogenic and proinflammatory genes, and also increases the sensitivity of tissues to insulin. This means that it can limit the tendency to gain weight. Researchers suggest that L. rhamnosus probiotic bacteria may positively affect mood and mental well-being. The clinical trials carried out over several years have shown that children who received a LGG-based probiotic in their first year of life rarely ever suffered from neuropsychiatric disorders. In 2011, the results of studies on rodents were published. They indicated the anxiolytic and anti-depressant effect of LGG. Although the precise mechanism of this action is not yet known, it is believed that LGG interacts with GABA receptors and may additionally change the level of key neurotransmitters (including serotonin and dopamine). In conclusion, ProbioBalance by Aliness® Rhamnosus GG Balance is a supplement, which is especially recommended in the prevention and therapy of diarrhea of various etiology. In addition, it may help to strengthen immunity and alleviate allergy symptoms. The results of research on the influence of L. rhamnosus on psychological well-being look very promising, too. ProbioBalance Rhamnosus GG Balance 30 caps. Preparations containing one strain of probiotic bacteria are an ideal choice for people who have never taken probiotics before. With a large number of strains, there is a risk that some digestive discomfort will appear in the initial stage of supplementation. It is worth remembering not to drink the capsules with hot liquids, because the high temperature may inactivate the probiotic bacteria. Bacterial coat: glycerol esters of fatty acids, capsule shell (hydroxypropyl methylcellulose). Natural avocado oil for an external use. Perfect for skincare, may be also used for skin massage. Plantain (Plantago lanceolata), a plant of temperate climate in the northern hemisphere, common in Poland. Its raw medical materials are the leaves of plantain (Folium Plantaginis}, including: enzymes (invert sugar, emulsin), flavonoids, tannins, iridoid glycosides, pectin, minerals (soluble silica, zinc), saponin triterpenes, mucus and vitamins (C, K) . It has a wide medicinal use because it has a protecting and coating effect, it is expectorant, anti-inflammatory, antiviral, diuretic, stimulates gastric juices, antidiarrhoeal, in addition applied externally it accelerates wound healing (e.g. by applying a fresh plantain leaves directly on the wound) and regeneration of the epidermis, used also in conjunctivitis inflammation.